As I am shifting to another place, it is very hectic for me, so posting a recipe which I had it in my draft for a long time.Coming to today's recipe-Mango Ginger Pickle - This pickle is a great combination with curd rice and also very easy to prepare. 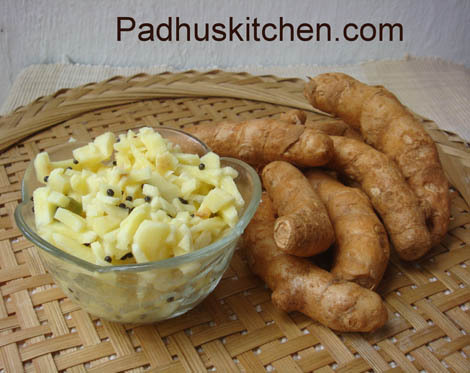 Wash and scrap the skin of mango ginger(manga inji), cut it into small pieces or into small rounds. Heat oil, add mustard seeds, when it splutters, add green chilli and pour it over the pickle . Mix it well.You can use it immediately but if you use it after a few hours, the mango ginger will absorb the flavor of lemon and chilli and will taste great. Sounds intresting recipe. Hope to see you soon. Mango ginger pickle sounds absolute yummy. I am in for it. pickle looks so simple and easy to make..looks yummy! Love the pickle and a very unique flavour. very interesting and delicious combo !! oh wow! Padhu, great recipe. I really appreciate you for posting forgotten recipes. My Mom prepares this but with Chilli Powder. Wonderful taste. Thanks for posting.. I'm loving the fiery and tangy flavors in this pickle. It must taste lip-smacking! Delicious looking pickle, So simple & easy! Nothing can beat mango pickle !! Hmmm, I love this pickle a lot. This is so easy to make. Thanks for sharing.